The Coalition for Equitable Policing (CEP) joined the Invisible Institute, a Chicago-based production company that seeks to increase visibility of controversial issues, at a community hearing Wednesday evening to advocate for greater transparency and accountability in the University of Chicago Police Department (UCPD). Held at the Experimental Station, the event was moderated by Jamie Kalven of the Invisible Institute. 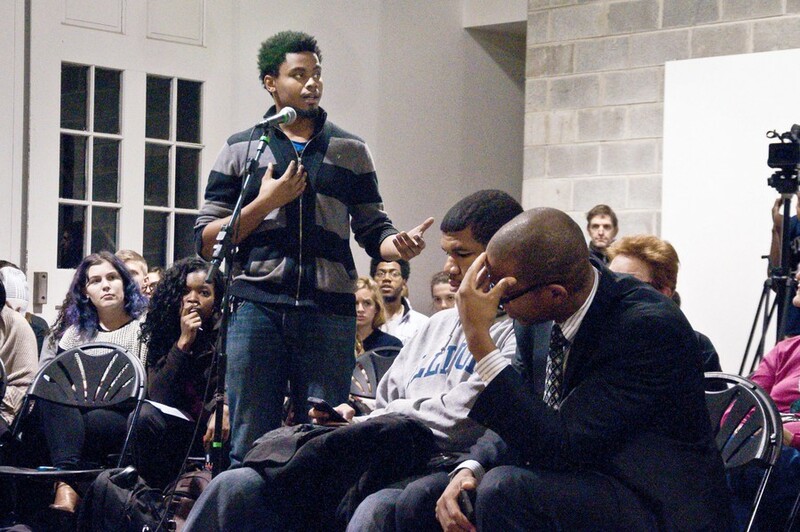 Community members were invited to share opinions about the UCPD in an open mic format. Several local elected officials were in attendance, including local alderman Leslie Hairston. Over a hundred people attended the event. Community members of various ages and affiliations spoke about the UCPD, alleging racial bias. Several black students from the University alleged that racist treatment from the UCPD has been a burden on their college experience. Hyde Park resident Jamel Triggs, who has been involved with the CEP for several months, said that the UCPD should stop discriminating against and start collaborating with the local youth, as they are the future of the community. Triggs works with youth at Blackstone Bicycle Works and is a former U.S. Marine, which he said colors his view of the UCPD. Former UCPD chief Rudy Nimocks commented on the disparity between the standards of transparency and accountability that apply to the CPD and those that apply to the UCPD. “University police departments do not have to disclose information in the same way that the city police do. Whether or not that’s a good thing or a bad thing—that’s for you all to decide. That’s what we’re discussing here today. It’s not that this can’t be changed. Police departments should respond to the kind of law enforcement that the communities they serve require,” Nimocks said. In regards to the future, Alderman Hairston suggested a way to transition the discussion into action. Hairston proposed convening an ad hoc committee to make recommendations to the University in order to leverage change. Coalition founder and fourth-year Ava Benezra said she intends to join Hairston’s proposed committee to promote transparency and accountability in the UCPD. CEP leader Tristan Bock-Hughes said the community’s comments resonated most with him.